1. Take your cell phone with you and start walking and looking. While you are looking, start calling friends and family and hand out assignments. One person can start posting pictures and info to electronic Lost and Found sites. One person can start knocking on doors and talking to mail carriers, police, etc..
2. If the initial steps aren't fruitful, continue to put up flyers. Refine them as necessary. Your first flyers will be haphazardly made. It's just important to get something out there. The Missing Pet Partnership has some good info on how to make noticeable flyers. 3. The Missing Pet Partnership also writes that when guardians loose dogs, they should look for people; and when guardian's loose cats, pet parents should look for cats. Basically they are saying that there is a good chance your dog was picked up and there is a good chance that your cat is hiding or is stuck in someone's garage or shed. I've already mentioned flyers twice. I'll mention them again here because they are so important. 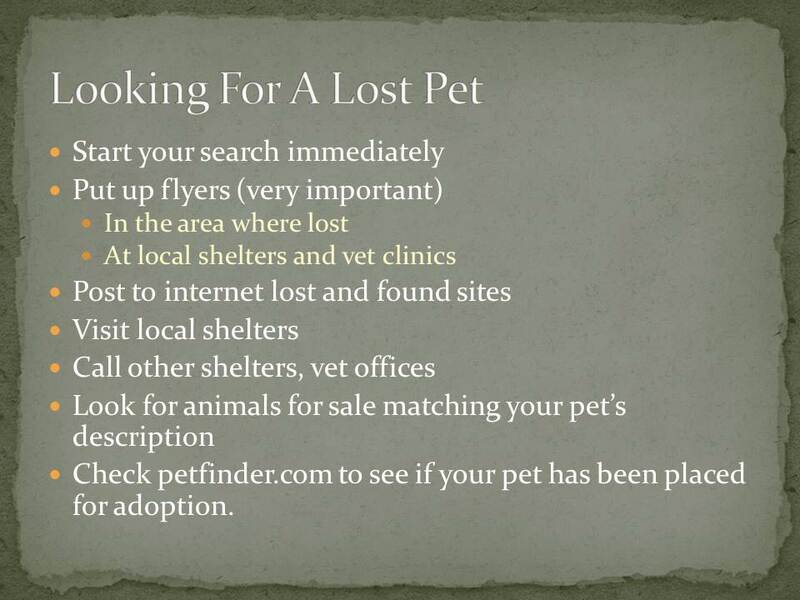 So many people find pets and make no attempt to find the original owners - so they won't see your ad on Craigslist. Flyers let people know that someone is looking for the dog they found. 6. 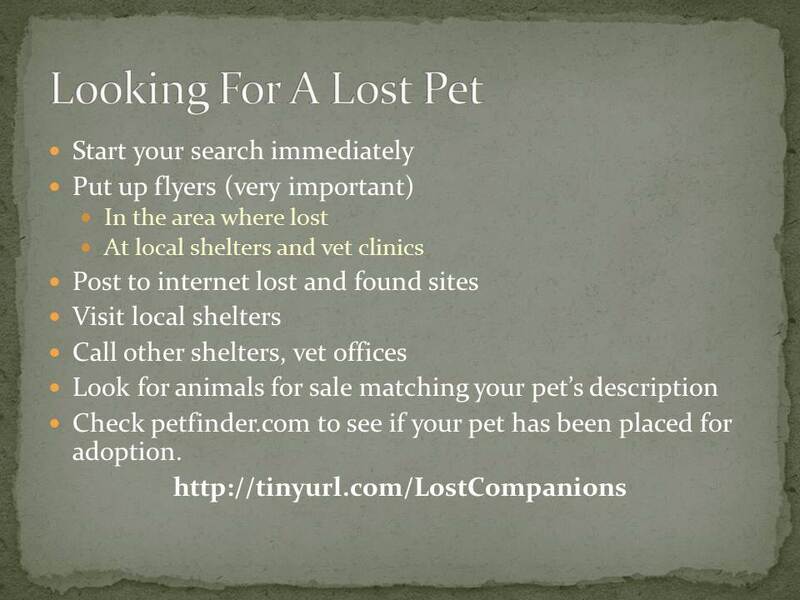 If you suspect your pet was stolen, do not put that on your flyers nor internet posts. It might scare away someone who has your dog. Especially if that person has already had some run-ins with the law. But do call the police. -- You might even advertise that you are looking to buy a pet that matches your pet's description to see what type of responses you get. 9. Search petfinder.com to see if you pet is up for adoption somewhere.